The Okanagan Valley is a spectacular place with amazing weather and home lots that offer some of the most breathtaking views you can imagine. People from across Canada continue to flock to our region, seeking an unparalleled lifestyle and the opportunity to build a dream home for a fraction of the cost when compared to cities like Vancouver or Toronto. Our most recent project in Carr’s Landing is showcases these million dollar views and some of the creative ways that we worked to capture them at their best. I am a big advocate of site-specific home design and it is important to do the best with what you have and adapt the home plan to fit the land, rather than the other way around. Rob and Lisa are a couple that truly understand great design and they were great to work with. When we started out, we had a couple of key goals; make the most of the 180 degree views and make sure that Rob had his separate garage and workshop. With these goals in mind, I set to work, sketching and planning a home that delivered on the wish list without ignoring the home site. 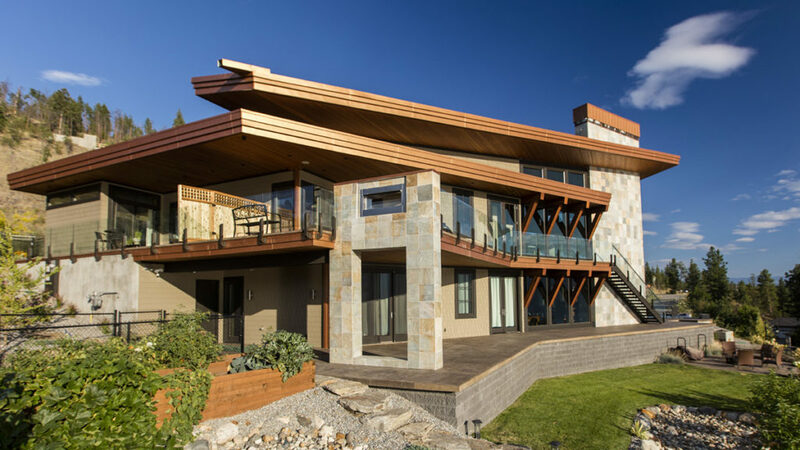 The Carr’s Landing home is situated on an unusual pie-shaped lot, on a mountain above Okanagan Lake with some interesting elevation changes. It became clear pretty early on that a traditional garage literally wouldn’t fit on the main floor. Instead, we designed a two-story garage with a workshop in the basement. Each garage offers its own entrance and the lower level garage created a beautiful, suspended concrete bridge that leads to the front door. The bridge created a fairly dark space within the hardscaped area of the subterranean garage. To let in more natural light and create an interesting feature, we opened up a space within the bridge and planted a beautiful tree. The tree rises up through the bridge itself and a custom-made grate allows natural light to stream down into the garage below. Like so many luxury Okanagan homes, the real star of Rob and Lisa’s home is the view. 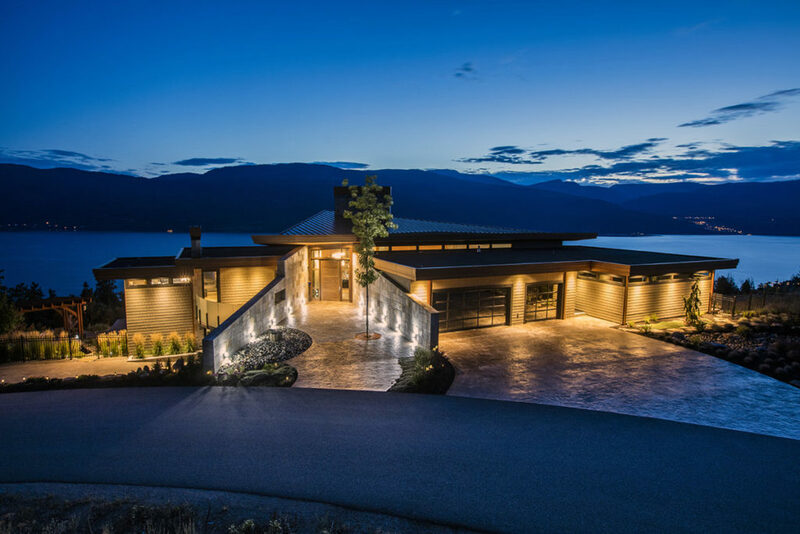 The unusually-shaped lot is situated on the east side of Okanagan Lake and offers panoramic, 180 degree views of the valley. To make the most of the spectacular scenery, I used Google Earth to create an angle directly towards the William R. Bennett Bridge, which stretches across the lake and connects Kelowna and West Kelowna. The kitchen and living room are located within this angular design feature, looking directly south of the home and straight towards the bridge and lights of the city in the distance. Heat is always a big factor in a west-facing home design; in the summer, a wall of west-facing windows is an invitation for hot rooms and expensive air conditioning bills. To address these challenges, I designed cantilevered rooflines and utilized the balconies to block out some of the western sun. The wall that contains the fireplace also acts as a sheer wall for stability and helps to protect the living room from some of the western sunlight. 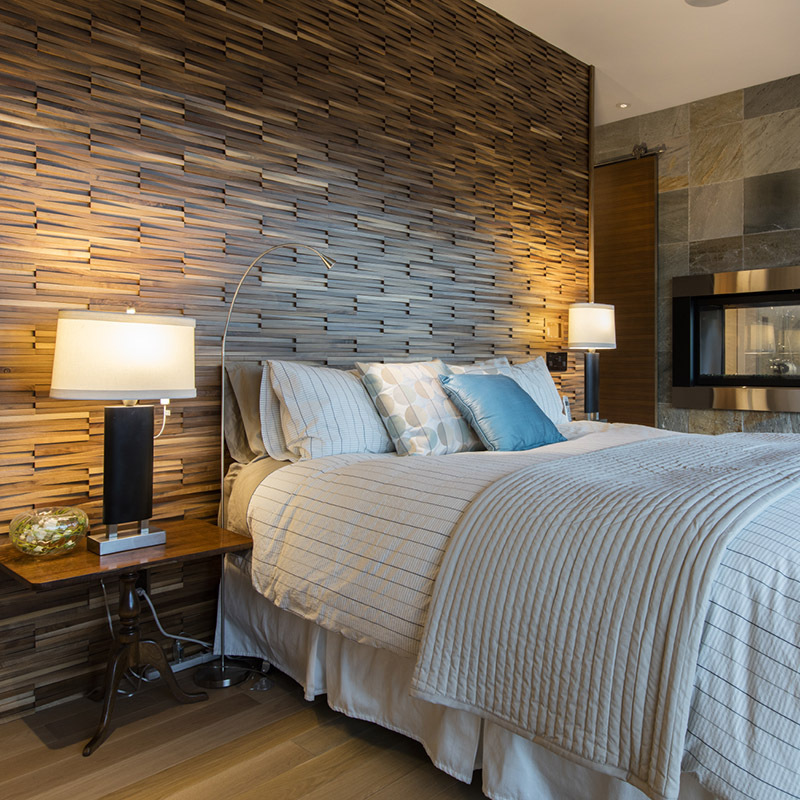 We used warm fir wood for the ceilings throughout the home, creating a cozy and modern West Coast Contemporary feel. The hallway and bathroom feature transom windows to let in natural light and all of the windows and doors are custom to the home; the front door offers a grand first impression with its 11’ by 4’ size. In the master bedroom, we positioned the bed to face the beautiful view, leaving space for a his and hers walk through closet on the other side of the wall. The master bathroom also boasts a spacious, private shower with a view and a double sided fireplace that is shared with the bedroom. We were also able to create a private, curved balcony off the master that is perfect for a coffee in the morning sun. An unusual angle isn’t the only distinctive aspect of this home’s exterior. To balance out the sheer wall for the interior fireplace, we added a similar wall and columns that contain a double-sided fireplace so that the lakeview isn’t obstructed from the balcony. I also designed a custom steel staircase that descends directly down from the kitchen to the pool to make outdoor entertaining a breeze. 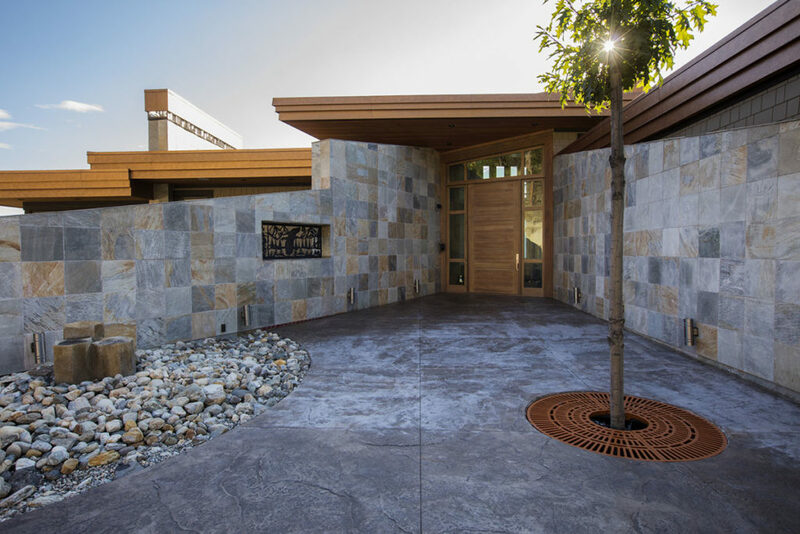 The exterior of the home was finished with Okanagan materials, including stone, timber and 16x16” quartzite tiles. 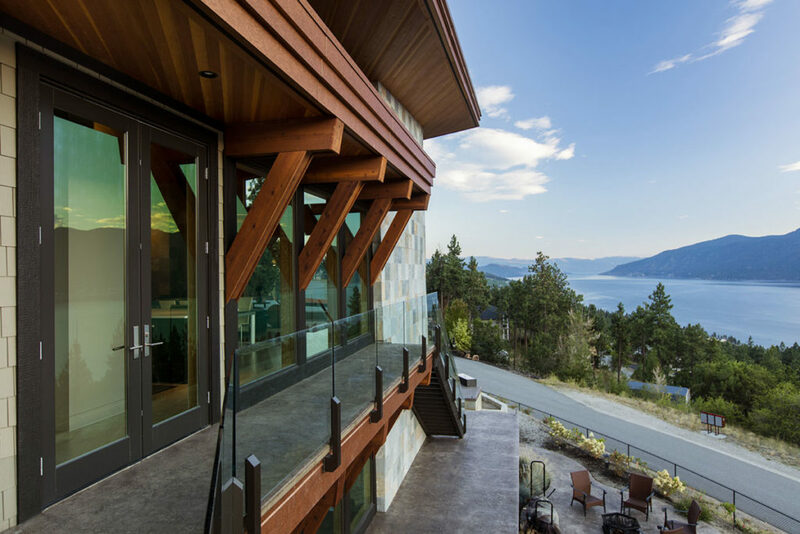 By letting the site dictate so much of the design, we were able to create a home that takes full advantage of the phenomenal Okanagan views. 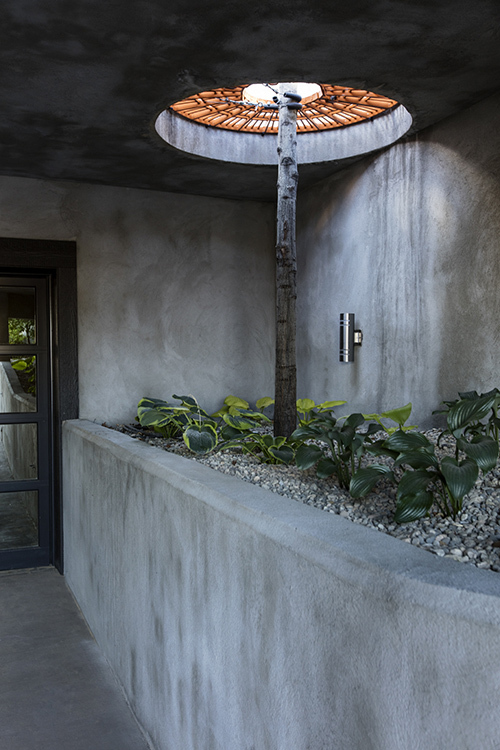 A willingness to be creative with the layout of the home also allowed us to create a beautiful four bedroom home with a private casita for guests, without a tremendous amount of excavation or alteration of the land. What others may see as a challenge, we saw as an opportunity to create something different and unique within the valley.